Hello from Hanoi! After a quick and easy flight on Vietnam Airways departing from the modern, giant Hong Kong Airport, we quickly made it to Hanoi. Departing Hong Kong was easy- having the flexibility to fly on a Wednesday afternoon paid off in cost and ease. We’re becoming quite excellent at navigating airports. And we haven’t had to pay any of the infamous departure taxes when leaving a country. So far, our airports have included Dayton, Minneapolis, Los Angeles, Auckland, Guangzhou, Tokyo, Hong Kong and now Hanoi. All in just under one month. Whew. After landing and clearing immigration with ease (we really haven’t had a single question in any country yet), we leaped into a taxi which we had set up in advance and was waiting for us. This was a nice bonus because we have already repeatedly been warned of shady taxi services throughout Hanoi. While Vietnam is, by and large, a very safe country, there seems to be no shortage of scams and hustles by opportunistic taxi drivers, “tour guides” and others. We’ve seen drivers everywhere clamoring for business, but with a little wherewithal, a list of reputable companies and our preference for walking, it hasn’t been a problem. 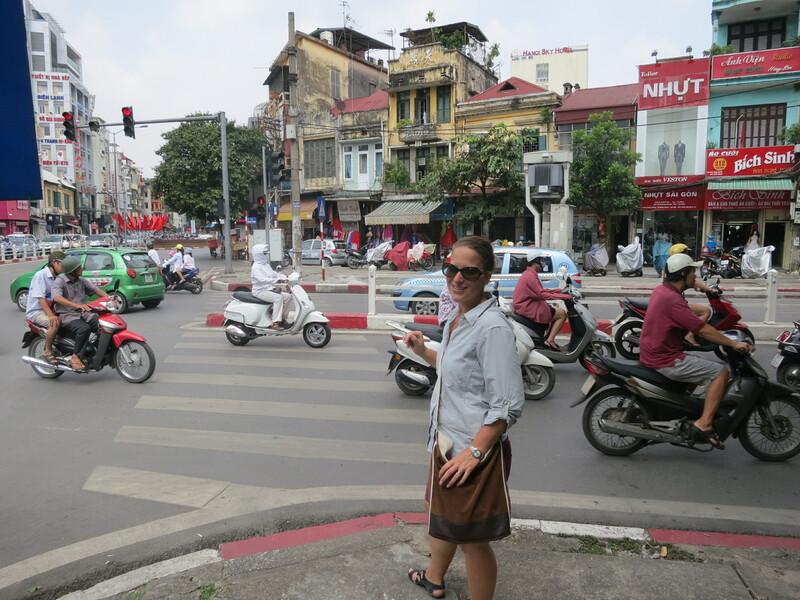 Brooke and I made a quick journey from the airport to the heart of Hanoi in the Old Quarter. Along the way into town, we saw what we think were buffalo just lazily hanging close to the side of the road. One of our first impressions of Vietnam? Motorcycles. I know that may sound odd, but I’ve never seen so many mopeds, scooters, and motorcycles in my life. I’m talking by a factor of ten. These two-wheeled vehicles are the preferred method of transport around Hanoi. Cars, bicycles and public buses all come in a distant second. It is kind of insane. Drivers take a liberal interpretation of traditional road rules and stop lights are few and far between. The constant sound of tiny horns dot the environment. Some scooters carry up to a family of four wedged on to the bikes – with young children in precarious positions conspicuously lacking helmets. With all this endless motorcycle traffic, being a pedestrian is an art form. Brooke and I have had to re-learn how to simply cross the street while negotiating an endless sea of bikes. The trick is to walk slowly and with confidence. And to take a leap of faith that the helmet-clad drivers (who mostly seem to be paying good attention) are not going to run smack into you. It’s kind of thrilling. Still, we’re not quite ready to navigate the major intersections just yet. Our hotel is smack dab in the middle of Hanoi’s Old Quarter. 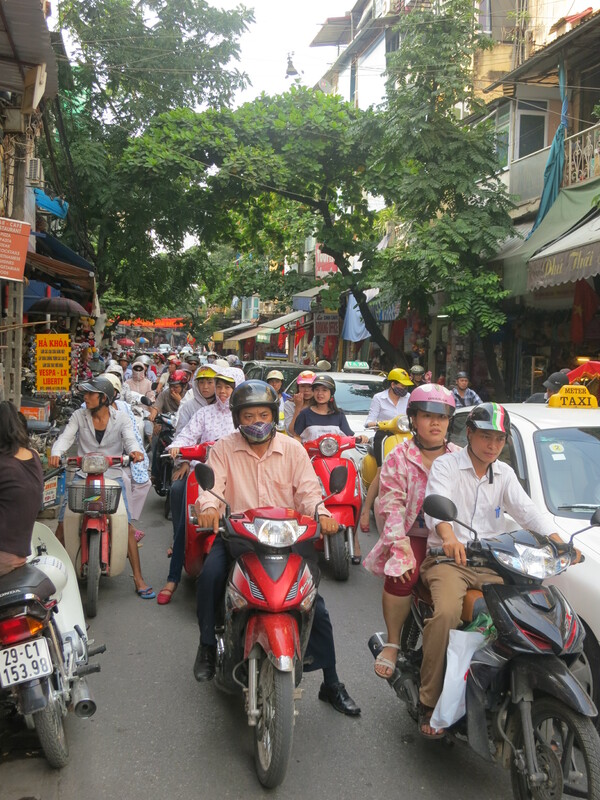 A section of Vietnam’s capital that is packed with people, shops and more motorcycles on streets that zig and zag in each direction. So far, some of the best sight-seeing has just been walking these streets. Short, bright blue and plastic stools filled with residents dining on simple, makeshift meals prepared on the street. Tiny storefronts that open up to the sidewalk and range across all sorts of businesses from sewing machine repair to T-shirt sales. These small two-story store fronts sometimes also double as people’s homes. Initially, we also thought we saw store owners and residents burning paper garbage on the sidewalk in small homemade fires, but later learned that this is actually part of Yu Lan – a religious ritual offering that happens over the course of this month. Vietnam truly feels more different from any place we’ve been yet – light years from Hong Kong. 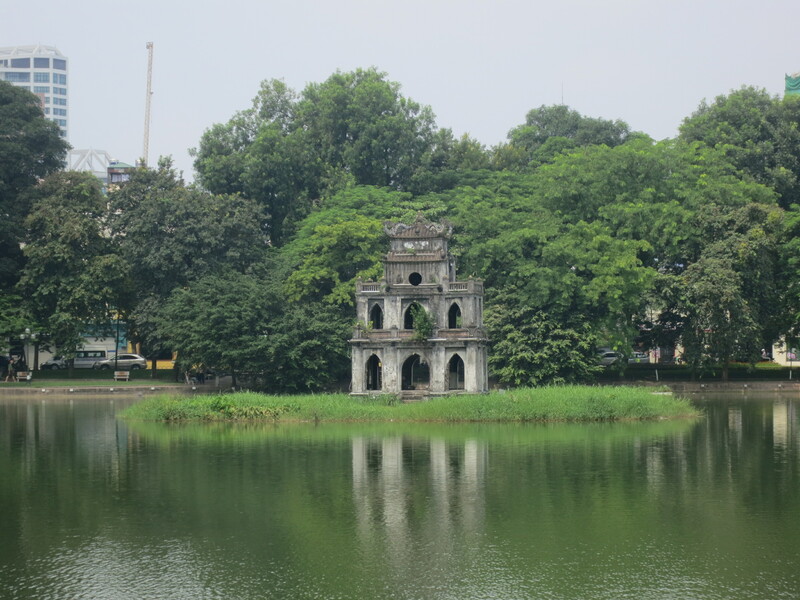 Hanoi feels raw and rugged, but cheerful and busy. A developing nation that’s driven to keep developing. I’m pretty sure that this is one of the most exotic places I’ve visited. And it’s an exhilarating place that we already kind of love. 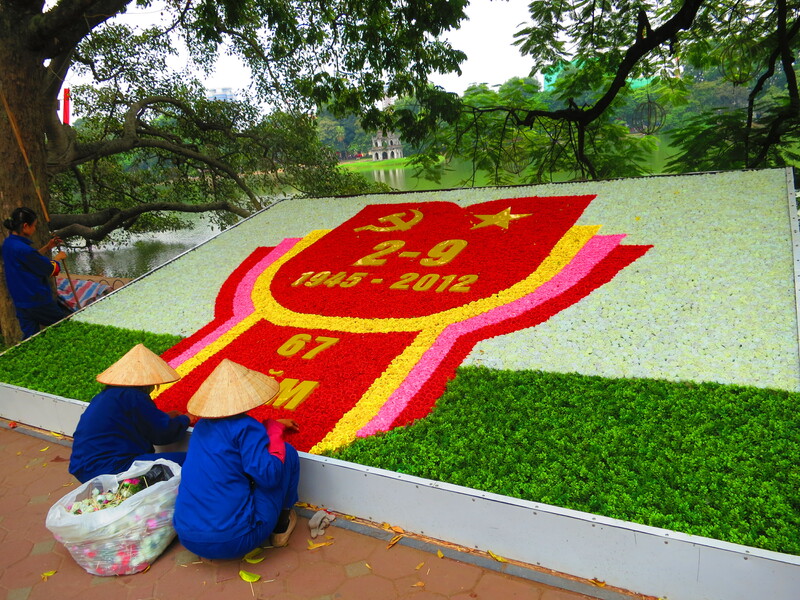 On top of all that, we’ve arrived just before National Day on September 2nd – Vietnam’s Independence Day. The town is dressed and decorated with banners, lights and more. It looks like it’s going to be a great holiday that we’re missing by one day. As you might imagine, it is friggin’ humid here. Our heat wave continues. A 20 minute walk earns you a healthy glow of sweat almost pouring from your body. Add the heat from the exhaust of a parade of motorcycles (Hanoi certainly isn’t going to win the award for cleanest award or most environmentally friendly city) and street fires, and everything just gets that much hotter. It feels like we could use another three showers a day. Fret not: we’ve built in lots of breaks at cafes and restaurants throughout the day. It’s amazing how much beer you find yourself drinking when you can’t drink any of the local water. Refreshing and inexpensive. 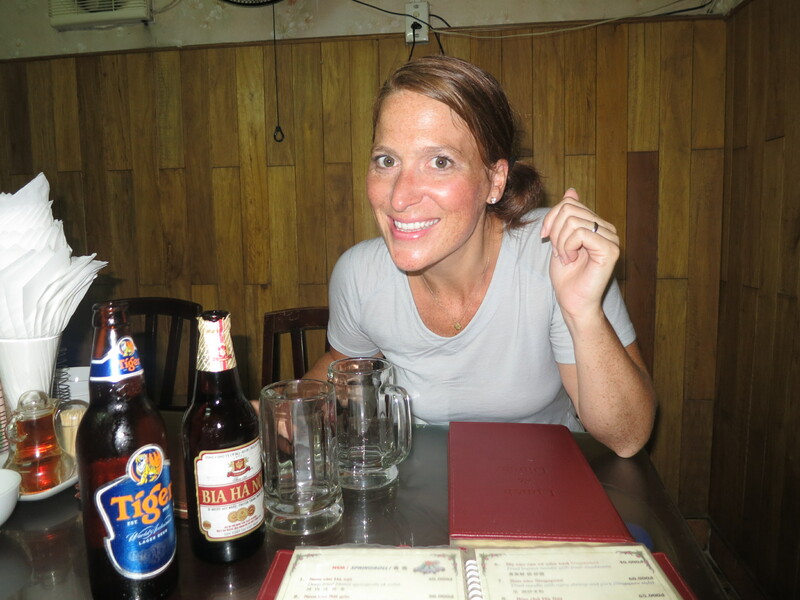 Our preference has been for the local Beer Ha Noi. The other commonly found beer, Tiger from Singapore, tastes like a poor man’s Bud Light. We continue to blow through Southeast Asia taking in as much as we can each day. We’re not alone – tourists are larger in number here, but most of the Western faces we’ve seen tend towards the younger side. A million discoveries await us in Vietnam. 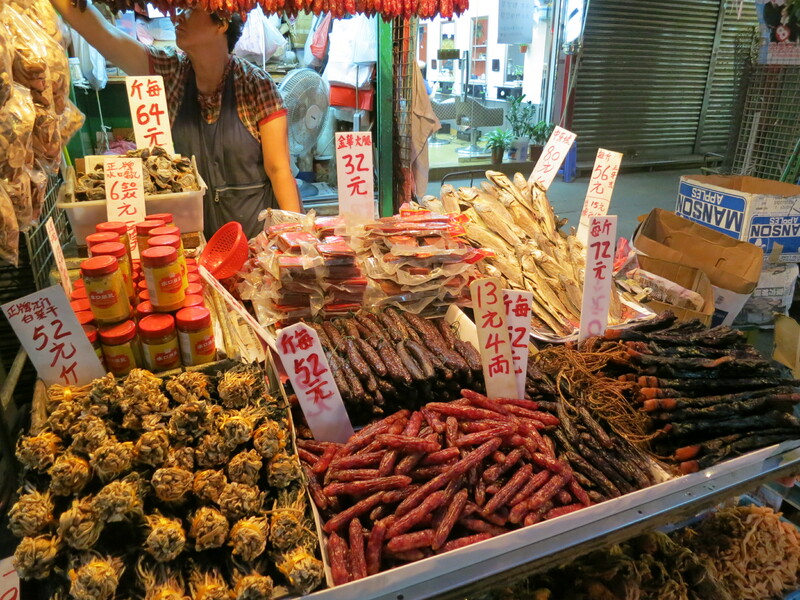 Hanoi brings food, culture, beer, history, coffee, baguette and more. Ready to open our eyes, clear our mind, expand our horizons and see something new. I can’t wait to explore Hanoi tomorrow. Our “Welcome to Hanoi” Dinner at the wonderful local New Day restaurant. Two big beers will help knock the heat off! 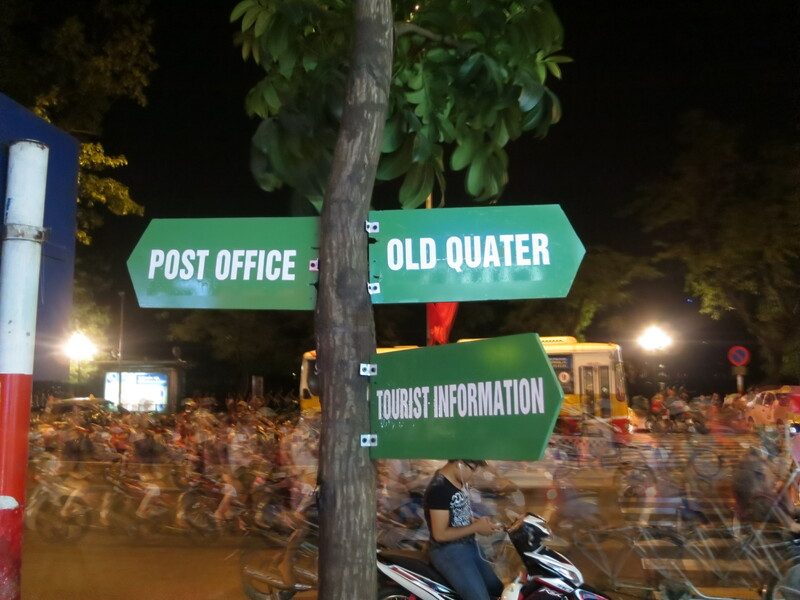 The Old Quarter At Night- Check out all of the endless bikes in the background! Click enlarge and the photo looks even more vivid! 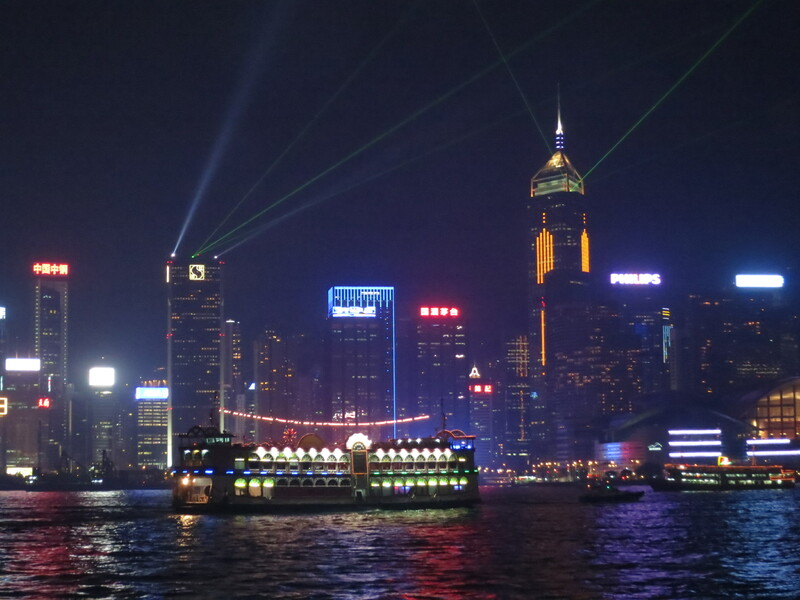 There are no two ways about it: Brooke and I have really enjoyed our time in Hong Kong. We really dig it here. We’ve been in town just long enough to get a taste for this unique city. 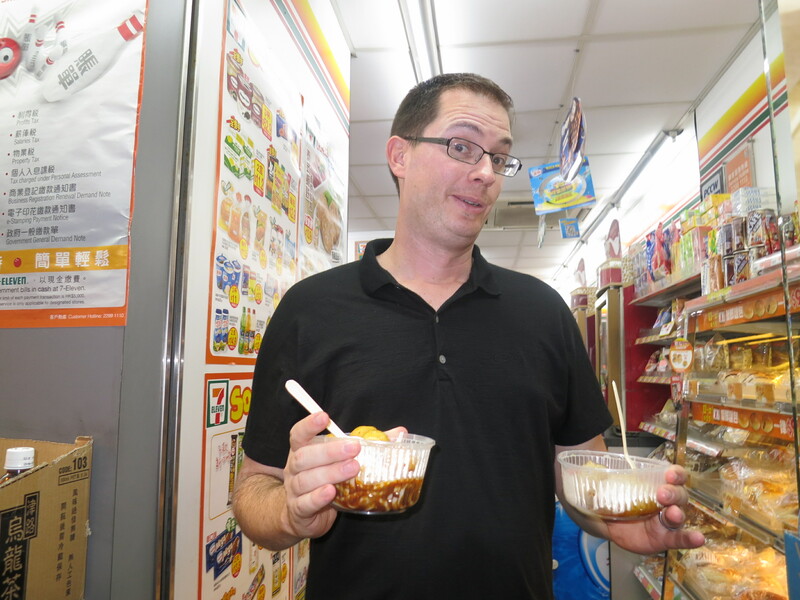 Three days has been enough time to allow us to get a sampling that left us with a quality impression of Hong Kong. This is a city that manages to be both part of China, but not much at all like the rest of China. As with every destination so far, we had some miscues upon first arriving. After rolling into town, we were quickly misled by signs indicating a “subway.” Turns out that a Subway here refers to subterranean passageways underground cross walk and complicated network of pedestrian tunnels scattered throughout the city. These help with the flow of streets and are far more often seen than traditional cross walks. The subways also have an added bonus of being a fantastic way to dodge the summer heat. Of course, we had misinterpreted the “subway” signs for an subterrain train (which is in fact commonly called the MTR). Speaking of the heat, we have been knee deep in it. 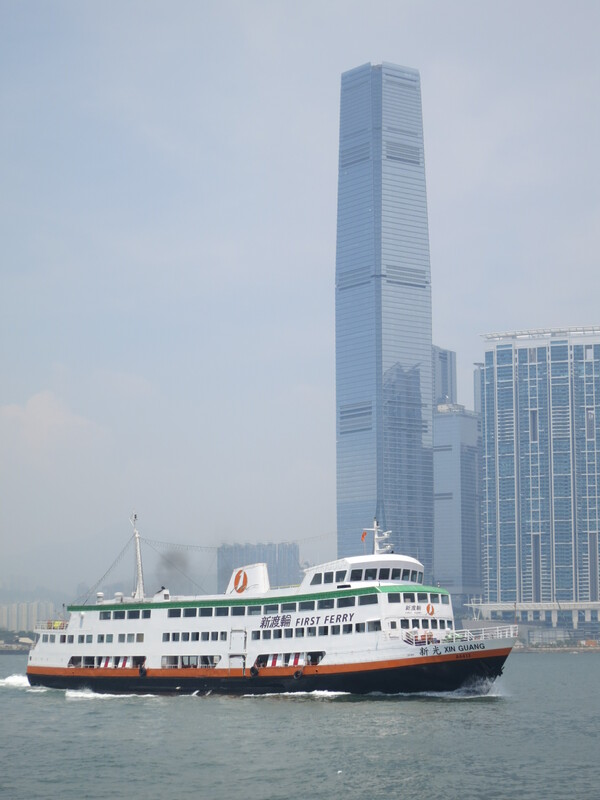 The sights of Hong Kong during the day have been plagued by some tenacious haze, but I suppose that’s what you get for visiting Southeast Asia in the middle of August. As unlikely as it sounds, it somehow keeps getting hotter and hotter as the day progresses into night. We’re pretty sure that by 8:00 PM it was hotter than it was at 2:00 PM! Baffling. As we head even further south into Vietnam and Singapore, we’re thankful that (so far) we’ve had no trouble finding places to stay that have functional, soothing Air Conditioning. 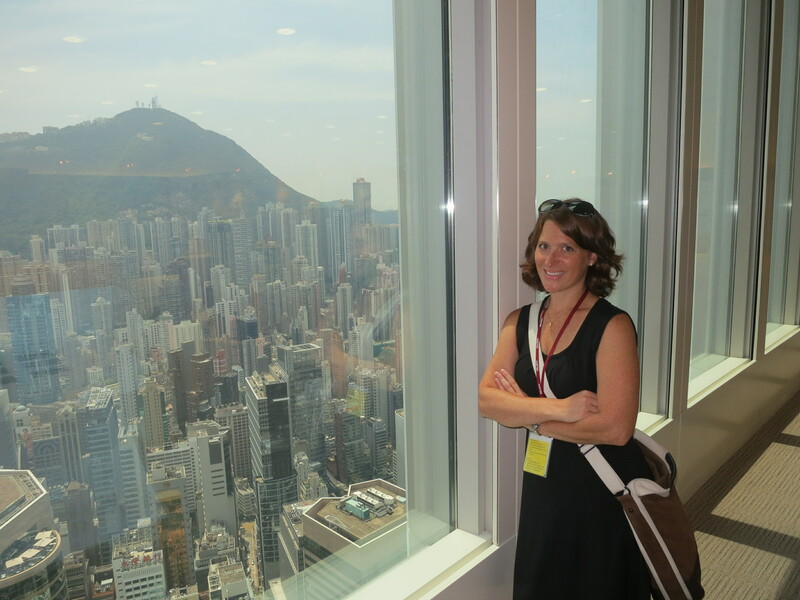 Brooke and the View from the free 55th Floor gallery of the IFC Tower! Over the course of several bus tours and self guided tours, we’ve taken in a pretty good chunk of the city. One of the great things about this trip has been being able to make connections. We were surprised to see that the “Occupy Wall Street” movement is apparently alive and well beneath the HSBC Bank building in central Hong Kong. There is a public space beneath the bank’s giant tower, reputed to be Hong Kong’s best architectural example of feng shui, that apparently has been bereft of campers and protestors since October. A movement is underway to kick them out, but it is kinda cool to see what was happening all over America also in play in the middle of Hong Kong. Speaking of banking, we’ve also found that Hong Kong hasn’t been the most inexpensive city, but it hasn’t been as costly as we expected a giant metropolis to be either. We’ve stumbled across some meals that are full of flavor, quick, cheap and no frills just the way we like it. But the (large) beers continually run us about seven dollars a pop. The only exception is during evening Happy Hours and in the outdoor markets where there are an abundance of deals to be found. In this weather, it is hard to resist a nice, cold beer in the middle of sight seeing during a hot day. We’ll keep looking for the perfect dive bar! Cost is all relative, I suppose, and flashy businessmen can be seen everywhere.The central neighborhood on Hong Kong Island is a spectacular mesh of glass and steel buildings banking, commerce, company headquarters and high quality hotels. It’s remarkable. There appears to be no end to the number of five star hotels. 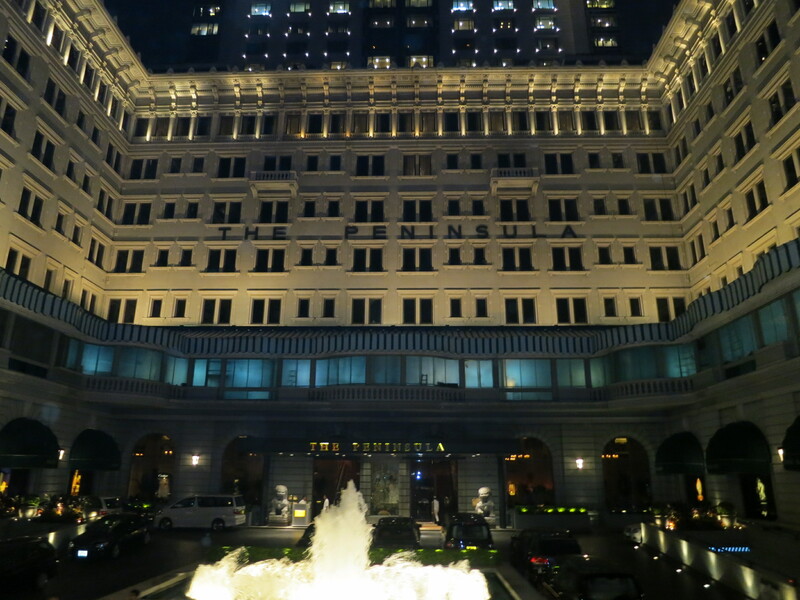 NEXT time, we will book a room at The Peninsula or the Ritz Carlton…or the Intercontinental! But that’s just one section of town. The culture here is a brilliant blend of 150 years of British colonial rule mixed with with an old Chinese City. The result is a mixed ethnicity, langauge and amusing juxtaposition like a Baptist church next to a market with fresh duck hanging in the window. 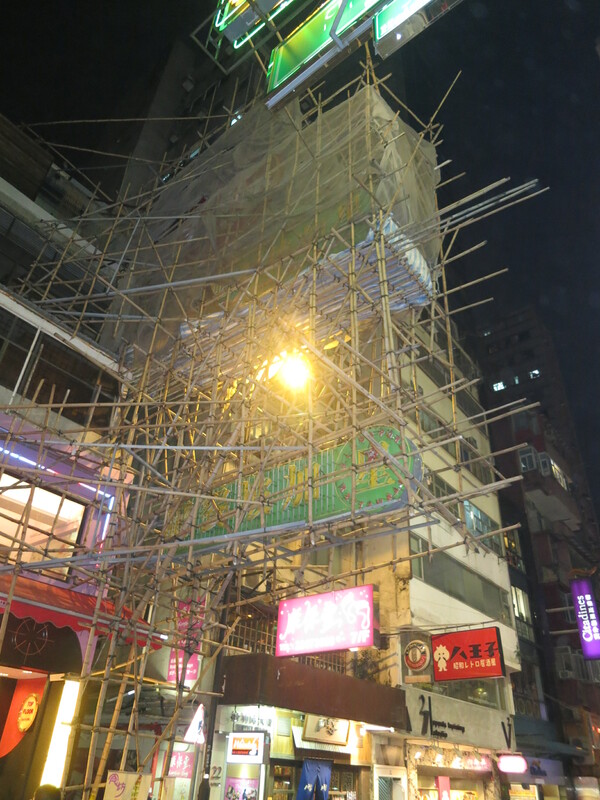 One of our favorite common sites is buildings under construction with workers climbing on scaffolding…made of bamboo! Bamboo Scaffolding could be found on buildings everywhere! Beyond Hong Kong, as we continue to expand our world view, it’s been good to see that some things are universal. A bride in Cincinnati looks pretty identical to a bride in Guangzhou, there are lines at the post office no matter where we go, drunk 19 year-olds at a Hotel bar in Hong Kong act a lot like drunk 19 year olds in the states. My personal favorite is that the tired businessman who kept leaning on me while falling asleep on the subway in Tokyo reminded me a lot of the tired businessman who kept leaning on me while falling asleep in NYC. And there are some shops we’ve found that are ubiquitous in any city. 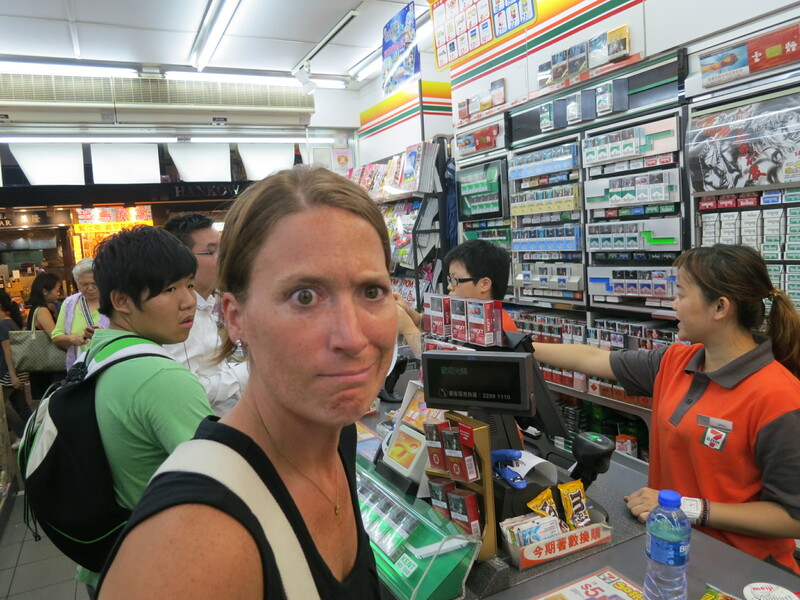 No matter where we’ve gone so far, we can count on seeing plenty of 7-11s (which have come in quite handy), Starbucks and McDonalds. Our one regret? We might have bought our souvenir set of Chopsticks too soon. Every other shop is selling an interesting set of chopsticks. It’s funny because when you are in the states, you never see stores falling over themselves to sell forks. I can’t wait to see what new experiences Vietnam brings. Onward! 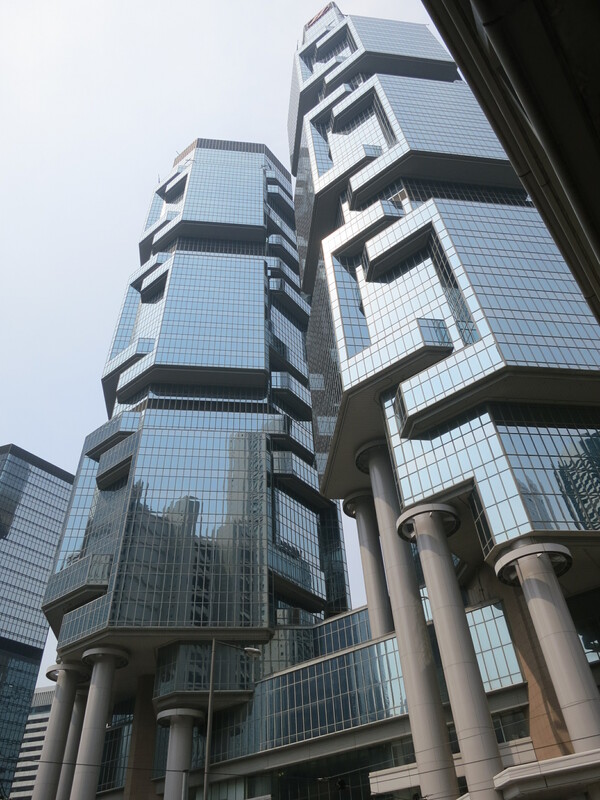 One of our favorite buildings- The twin Lippo Centre which are said to look like Koala Bears climbing the building!